Monet once referred to his garden as his most beautiful masterpiece. 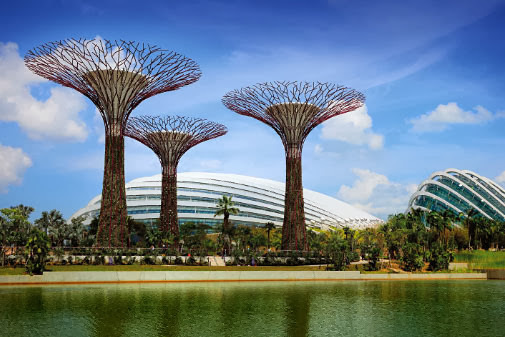 Singapore’s new icon, a 101-hectare horticultural attraction, certainly seems to be the nation’s most beautiful with more than 380 thousand plants in huge domed conservatories. Less than a five-minute walk from Marina Bay, the Gardens is split into three waterfront spaces: Bay South, Bay East, and Bay Central, which connects the first two. Bay South―the largest waterfront garden―is where you’ll find the impressive Supertrees. These 9 to 16-storey-tall vertical gardens collect rainwater, generate solar power and act as venting ducts for the park’s conservatories. A suspended 128-metre-long walkway between two Supertrees, the OCBC Skyway, is perfect for walks at any hour, offering a bird’s eye view of the Gardens and the Marina Bay urban area. At Bay East, there’re pretty pavilions, lush lawns, tropical palm trees and natural blossoms, ideal for an evening stroll or a picnic with family and friends. Along its two-kilometre waterfront promenade, you can get an amazing view of the skyline. For a reprieve from the tropical heat, head to the cooled conservatory complex, which won the World Building of the Year at the World Architecture Festival 2012. There, you can study plant species from around the world such as baobabs and date palms. After the sun sets, don’t miss the sky show of dazzling lights and sounds in the OCBC Garden Rhapsody, which takes place nightly amidst the Supertrees. It’ll make a wonderful ending to a day out in the Gardens.